New Horizons is healthy and has just last month completed the halfway point in its long download of 50-plus gigabits of Pluto system data that we collected last summer. We expect the download to continue through October or November of this year, with more data coming to the ground virtually every week until then. 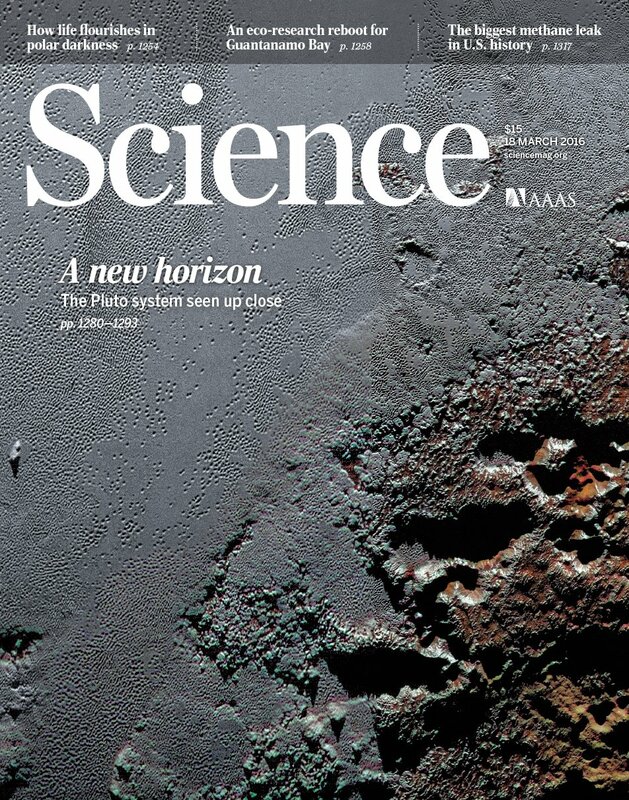 And in July we’ll conduct a final Pluto flyby calibration of all seven scientific instruments aboard New Horizons. This week, though, we completed and turned in our proposal to NASA to continue the exploration by New Horizons. The proposed effort covers another almost two billion miles of space, lasting until 2021, and includes another close flyby, in 2019. NASA will carefully evaluate this proposal for funding and let us know the outcome by June or July. I’m so excited about what we proposed that I thought I’d write about that “extended mission” in this installment of the New Horizons PI Perspective, so you can learn our plans too. We call this mission to explore the Kuiper Belt (KB) “KEM” — for KB Extended Mission. The centerpiece of the KEM is the close flyby of an ancient Kuiper Belt object (KBO) called 2014 MU69 on Jan 1, 2019 — yep, on New Year’s Day! The planned flyby will approach MU69 to about 1,900 miles (3,000 kilometers), which is about four times closer than we flew past Pluto. Consequently, imaging and compositional mapping spectroscopy resolutions are all expected to be even better than what we achieved at the Pluto system! We discovered 2014 MU69 (or MU69, for short) in a dedicated search for possible extended mission flyby targets that we conducted in 2014, using the Hubble Space Telescope. MU69 is about 21 to 40 kilometers across, which makes it about 1,000 times more massive than comet 67P that Rosetta is orbiting but about 500,000 times less massive than Pluto. This places it in a key intermediate size regime to better understand planetary accretion. And given its 4-plus-billion-year existence in cold storage so far from the sun, MU69 will be the most pristine object ever visited by any space mission. With NASA’s concurrence, we fired the engines on New Horizons late last year to target this flyby before it cost too much fuel — which would have happened had we waited. 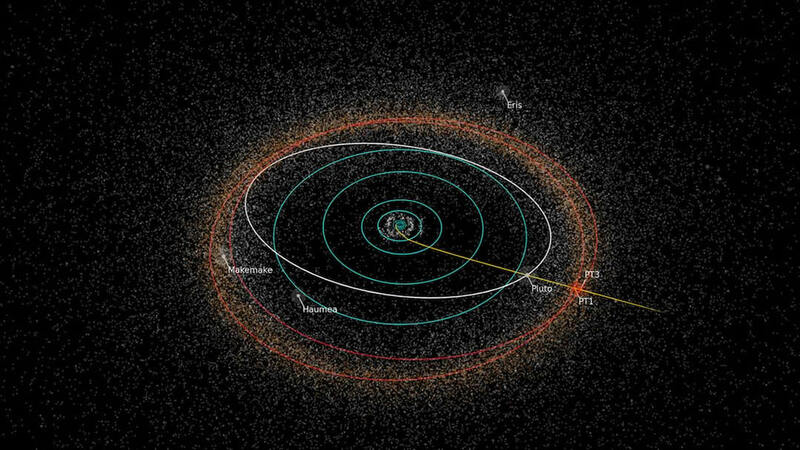 In late 2015, with NASA’s concurrence, New Horizons was targeted to make a flyby of an ancient Kuiper Belt object a billion miles beyond Pluto, with closest approach planned for Jan. 1, 2019. New Horizons will use all seven of its scientific instruments to explore MU69. The encounter will include detailed global and high-resolution mapping, including color mapping. It will also include compositional mapping, searches for moons of MU69, studies of its surface properties, and searches for an atmosphere. If KEM is approved, flyby operations would begin about 100 days out, in late September 2018 (just 2½ years from now!) and continue through the first week of 2019, after closest approach. MU69 data downlink will take 20 months, until late 2020. 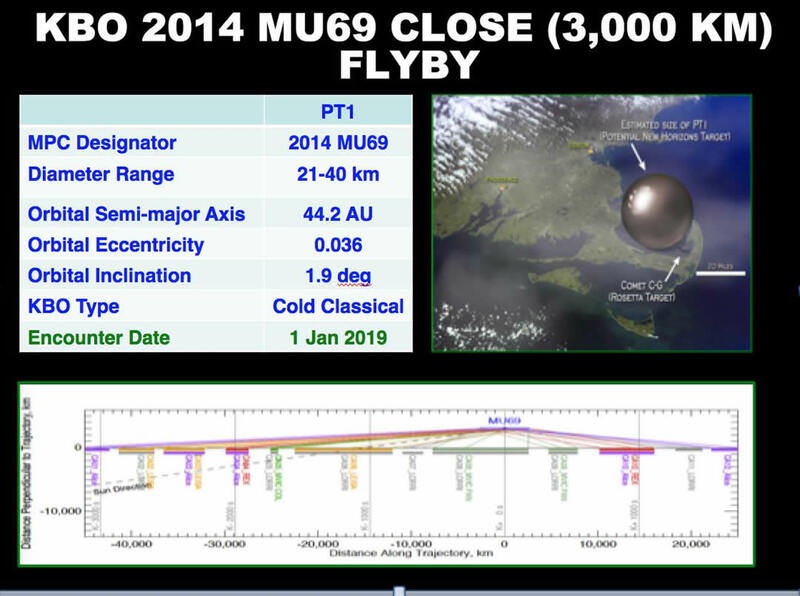 Some of the attributes of our flyby target (2104 MU69) and our preliminary flyby plans are summarized here. Simulated Ralph/MVIC (left) and LORRI (right) close-approach panchromatic imaging of MU69, showing expected resolution using imagery of Mars’s moon Phobos (which is similar in size to MU69). If I do say so myself, the flyby of MU69 would be a landmark event, shattering all distance records for deep space exploration, and yielding an impressive scientific bounty. 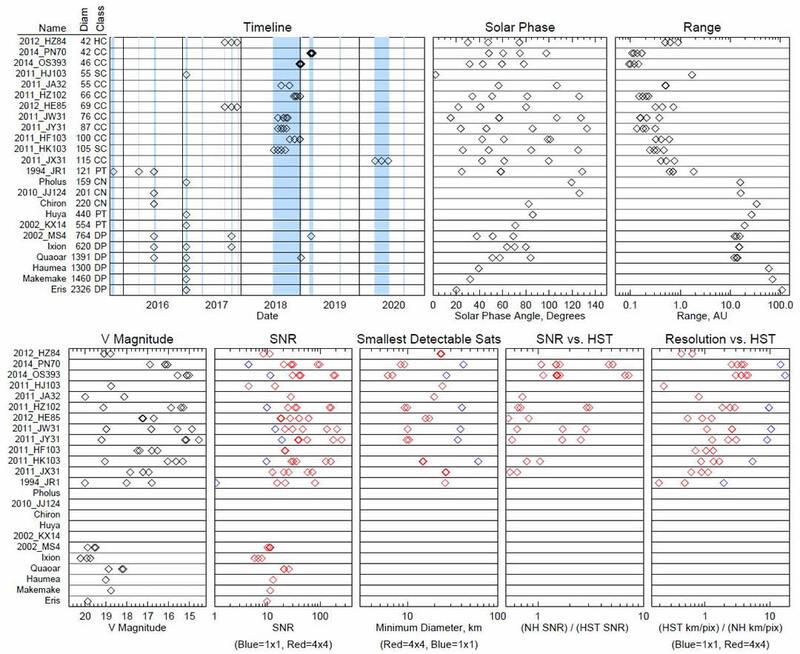 Make distant flyby observations of about 20 other KBOs during 2016-2020, determining their shapes, satellite populations and surface properties—something no other mission or ground-based telescope can. Conduct a heliospheric transect of the Kuiper Belt—making nearly continuous plasma, dust and neutral gas observations from 2016 to 2021, when the spacecraft reaches 50 astronomical units (AU) from the sun. A summary of distant KBO and Centaur observations in KEM. In the timeline (upper left), blue vertical bars indicate targeted periods when observations are possible. Object diameters, in kilometers, assume an albedo of 0.1 for smaller objects where the true albedo is not known. Object classes are as follows: CC=cold classical; HC=hot classical; CN=Centaur; PT=Plutino; SC=Scattered; DP=dwarf planet. Diamonds show geometry and expected observation signal-to-noise ratios (SNRs). Satellite search limits assume satellite albedos of 0.10 and 3σ detection thresholds. The Kuiper Belt is a rich scientific frontier. Its exploration has important implications for better understanding comets, the origin of small planets, the solar system as a whole, the solar nebula, and dusty Kuiper Belt-like disks around other stars, as well as for studying primitive material from our own solar system’s planet formation era. The exploration of the Kuiper Belt and KBOs like MU69 by New Horizons would transform Kuiper Belt and KBO science from a purely astronomical pursuit, as it is today, to a geological and geophysical pursuit. With New Horizons so healthy, so capable of carrying out KEM, and so successful at Pluto, we are optimistic about our proposal, which NASA will soon have peer reviewed. If KEM is approved, we will begin both KEM science observations and MU69 flyby planning this fall. If the proposal fails, we will have to turn the spacecraft off in December for a lack of funds to continue. 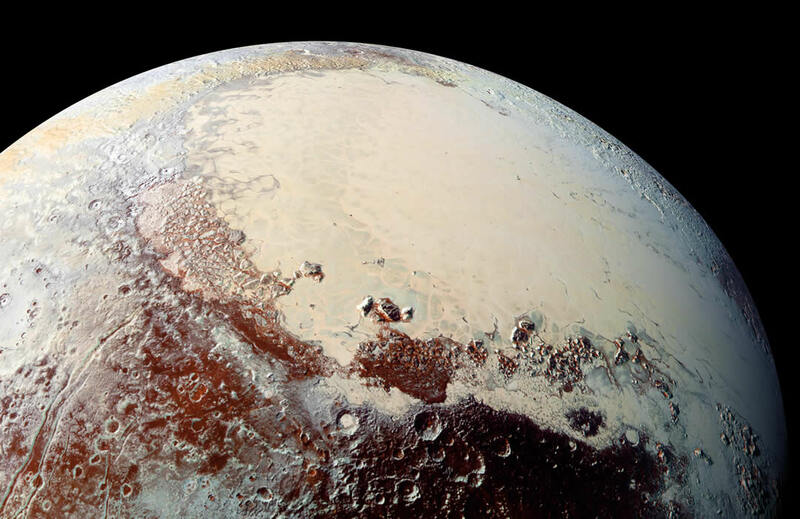 In the meantime, while we await word, we continue to download and analyze data from the Pluto system, creating new science every day as we make discoveries. The flyby of Pluto may be nine months in our past, but the data it has provided is truly a gift that keeps on giving. That’s it for now, and I’ll write again soon. Until then, I hope you’ll keep exploring — just as we do! A wide swath of the close approach hemisphere of Pluto, in enhanced color, as seen by New Horizons, in July 2015. Data like these are contributing to discoveries every week.